On Thursday, Friday and Saturday evening a remarkable transformation takes place in the Express Café, the long lived greasy spoon in Market Row. The tables are the same – yellow formica with attached red plastic seats but now there are new pictures on the walls, covers over the counter and large posters advertising the Electric Dog. We visited on a Saturday when the night market was in full swing so reducing the squash in the Brixton restaurants. At 8.30pm there were lots of spaces inside Electric Dog although the alleyway tables were full. We enjoyed all the food and our decision not to go with two Combos was justified as there was easily enough for two with the dogs and one fries. The buns were not too sweet and held together even with all the sauces which is a blessing – they do provide knives and forks but this is definitely hand held food. But the point of a hot dog is in the sausage and we were really impressed with the pork sausage and will return to try the beef. The sweet potato fries were excellent – very hot and crisp and they didn’t go soggy even until the last bite of the dog. Although there is no alcohol there is a wine shop almost directly opposite this restaurant and there is a list of interesting soft drinks. I chose the cherry milkshake which was pink with cherry bits but not as strongly flavoured as I would have liked. It was also incredibly sweet but this is hardly a criticism just a description of my lack of a sweet tooth. They also have a list of Fentiman’s drinks including rose lemonade and my favourite Dandelion and Burdock and do provide tap water on request. We have been criticised for not providing “reviews”. We set out to describe the meals we enjoyed and at first didn’t go to restaurants we didn’t like. But our critic clearly has not read all our posts particularly the one on Happy Dumpling. I mention this only to give context to the next sentence. This is a pop-up restaurant which has a limited life – JUST TWO MONTHS so we strongly recommend that you visit soon or potentially miss it altogether. The meal for two cost £16.50 – in our view a bargain. This small cafe on Coldharbour Lane is a favourite throughout the day for those wanting a fix of a Full English. 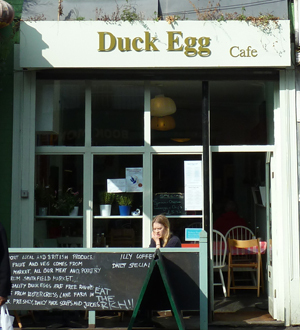 We have had breakfast and lunch at the Duck Egg Cafe and so thought it was about time for a review. For breakfast we arrived at about 10.30 and it was already pretty busy (there was even a queue for tables at one point). It is so small that sharing tables is almost essential and you are so close to the other diners that it is very hard not to eavesdrop. However I’ve noticed this is a theme throughout restaurants in Brixton so I say embrace it. The service was very friendly and the seating comfortable. We ordered a bacon and egg sandwich (boring choice I must confess) and the Full English (obviously had to try this!). You get a choice between hen or duck eggs and of course we went for the duck eggs as it seemed silly not to. Service was quick, big plus as my stomach rumbles were getting louder and louder. The full English came with all the trimmings, sausage, bacon, mushrooms, toast, egg (poached) and baked beans. The egg was cooked to perfection with the yolk breaking to reveal the golden runny centre which all poached eggs should have. Sausages were also a plus point, not sure if they were local or not, but they were a stand out part of the meal. Tea, coffees and juices are the drinks of choice with the juice coming fresh. Other breakfast options include eggs Benedict, which is most definitely on the list to try on our next visit. Breakfast was £8 for the full english and a cup of tea, while the egg and bacon sandwich was about a fiver with a coffee. Great choice for a lazy weekend brunch. For lunch again it was a sharing experience and crowded. We had the special soup of the day but we noticed that other plates were heaving with pasta and chips. Again not a cheap meal but it was hearty and filling. You can also choose breakfast options throughout in the day as well as the pasta options. We will be returning when we are very hungry to make the most of it.